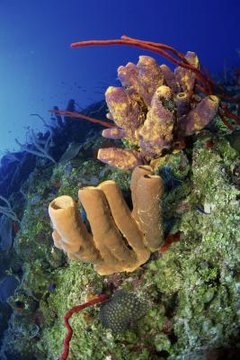 Sponges are animals that belong to the phylum Porifera, which means "pore bearer." The name fits them perfectly, since their rigid bodies are covered with small holes. Sponges are unique members of the animal kingdom. They possess several traits that set them apart from other aquatic wildlife. Sponges have no nervous system or organs like most animals do. This means they don't have eyes, ears or the ability to physically feel anything. However, they do have specialized cells that carry out different functions within their bodies. While adult sponges are not mobile, they are able to react to certain physical stimuli despite lacking conventional organs and sensory systems. Sponges have no nerves or brain, so they lack any ability to cognitively control their movement. Their simple anatomy is similar to that of the earliest members of the animal kingdom. They split from the taxonomic hierarchy very early and are so primitive that they are sometimes placed in a subkingdom of Animalia called Parazoa, which means "beside the animals," according to Allegany County Public Schools Virtual Field Trips. Since sponges have no true sensory organs, they aren't capable of hunting prey. Luckily, they don't have to move to find food. These animals grow on hard surfaces along the ground beneath oceans, lakes and bodies of water. The pores that cover their bodies are filled with specialized cells called choanocytes. These cells are equipped with small tentacles called flagellae that whip back and forth to pull water into the sponge's body. The sponge filters small organisms, like bacteria and plankton, out of the water and consumes them through a process of phagocytosis, according to Animal Diversity Web. Sponges lack blood or a circulatory system, so each cell digests and processes food individually. Sponges can't digest everything they find in the water, so they expel or "vomit" these inedible particles. Some researchers compare the process to sneezing, since the water and inedible matter is expelled through a rapid bodily contraction throughout the sponge. While scientists don't fully understand the mechanism that allows sponges to coordinate a bodily contraction, they have found that fluctuating calcium levels throughout the body are associated with the reflex, according to the Society for Integrative and Comparative Biology. A rapid succession of spikes and drops in calcium level occur during the sneezing reflex in some sponge species. Sponges are hermaphrodites, so they aren't restricted by gender. Each organism can act as a male or female and may change roles on the next reproductive cycle. Sponges can reproduce sexually with other individuals or procreate asexually. Each fertilized egg develops into a free-floating sphere of cells called a blastula. The baby sponge floats freely in the water for weeks or months before settling down and developing into an adult sponge. Larval sponges lack organs and sensory systems just like adults, but they are considerably more mobile and can travel great distances on water currents before establishing themselves.